We have travelled to France using Dover - Calais, Newhaven-Dieppe, Caen-Cherbourg, Portsmouth-Caen, Portsmouth-St. Malo and Plymouth-Roscoff. 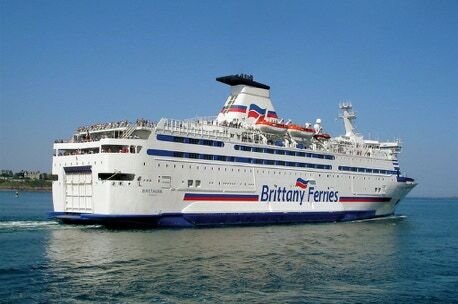 There are different ferry companies operating a variety of different routes, however, your choice of ferry ports will depend on where you want to go in France, cost, times of departure and/or arrival of the ferry. • Use a relatively quiet exit port (such as Plymouth right) for your first trip over the Channel as using a busy port can be quiet daunting. • Similarly a smaller entry port (such as Roscoff) will be much easier to negotiate. • If taking a day sailing think about camping near the French port to give yourself time to acclimatise to driving on the &apos;wrong&apos; side of the road. "Try using a quiet entry port, such as Roscoff, for your first trip"
An overnight sailing will allow you to get an early start - but don&apos;t plan to drive too far in the first day. If you are travelling from Dover and arrive earlier than your allotted time it is worth asking if there is room on the next available sailing - there usually is especially out of season. • Arrive early - check your tickets because many operators require you to arrive a considerable time before departure. 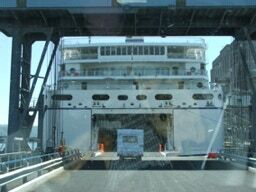 Arriving at the ferry port can be a bit daunting as you arrive in the ferry port. Signs and notices telling you "don&apos;t do this" and "don&apos;t do that". Men and women in reflective jackets making inexplicable gestures and seeming to expect you to know exactly what they mean! But don&apos;t worry, you are not the first and you won&apos;t be the last so just take your time and everything will go smoothly. Some ports have more than one ferry company using it so check carefully who you are with. "Don&apos;t do like we did and get in the wrong queue!" We&apos;ve been crossing the channel for many years yet not so long ago we happened to get in the wrong ferry queue and after explaining our predicament were very politely told how to get back out and start again. Unfortunately the only way out was by joining the traffic leaving a ferry so we were given a special card to prove we were just &apos;passing through&apos; - we felt very embarrassed as we sheepishly explained to the stern looking customs official that we hadn&apos;t yet left the country!but we got by and were soon in the right queue so, keep your eyes peeled, follow instructions and don&apos;t get complacent, like us! At most ports you start by approaching the ferry booths (assuming you have a pre booked ticket that is, otherwise you will have to buy it first). At the booth the staff will check your ticket and probably your passport, you will then be give a card to hang from your rearview mirror stating your lane number and destination. When instructed follow the well marked and numbered lanes into the number you have been told to join - there are always plenty of staff around to guide you. You can usually see the ferry from the waiting area. Don&apos;t be surprised if you are called into a separate checking area, in these times of terrorist attacks it is usual to have your vehicle looked at both inside and underneath and you may be asked if you have left your vehicle unattended at any time (i.e. service areas) but these people are only doing there job and trying to keep us safe so don&apos;t feel that it is in any way a personal check on you. Once in the lanes you might be in for quite a wait depending on whether you arrived early and if the ferry is on time. Most people get out of their vehicles and have a wander about, chatting and passing the time of day. Some even go up to photograph the ferry arriving. Tannoy announcements will tell you when to return to your vehicle. There are also nice cafe areas, shops and toilets at most ports. Take this time to also prepare what you are taking on board with you. Remember that you are NOT allowed back to your vehicle during the crossing so if you forget something important like your glasses or tablets you will have a big problem. For an overnight crossing you will need a small bag with toiletries, change of clothes, night things etc. For a day crossing perhaps a book or magazine or a game for the children. Don&apos;t forget your passport, some operators require you to show this before you can buy duty free goods. Boarding the ferry is probably the most daunting part, at least for the driver, but again don&apos;t worry, all the staff are friendly and if you just follow their instructions all will be fine. 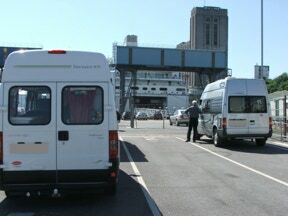 As you approach the ferry it is best to go slowly, we&apos;ve seen the occasional motorhome &apos;ground&apos; as the back end touches the floor because the ramps are so steep - slow and steady until you are fully on the ramp is the best advice (the same applies when coming down). Once inside you will be guided up very close to the vehicle in front and instructed to leave your handbrake on and vehicle in gear. "Don&apos;t forget which deck you left your vehicle on!" Exits are well marked but usually it&apos;s easier to just follow the crowd. IMPORTANT at this point make a note of the car deck you are on and the number of the door/stairs you are exiting at. You will need to find this same place to return to your vehicle. When you get up into the ferry have a look around and make some mental notes as to where you have come up so that it will be easy to find again. These ferries can be quite like a maze at times and there is nothing worse than not knowing where to go when the announcement to return to your vehicle comes. Some ferries are now handling our cards with deck and staircase numbers on them. Make doubly sure you have everything with you that you might need during the crossing before leaving your vehicle. Warm clothing in case you want to go out on deck and if you are one of the first on you can sit back and watch other people boarding. Also remember money, passport, overnight bag for a night crossing, or things to pass the time during a day crossing. "Warm clothing might be needed on deck even on the sunniest of days"
The ferries are so big that it would be unusual not to find somewhere comfortable to sit. There are lots of things to do while on board too, shops, cafe, restaurant, bar, games rooms and sometimes even a cinema. The bureau de change offers the opportunity to change money but it&apos;s usually better to get foreign currency before you go as the exchange rate is normally not so good on board. Many ferries will accept both £ and Euro, so even allow you to use a variety of both as they have sophisticated computer/till systems which can convert the figures - this is ideal on the journey home if you have any spare Euros but not quite the full amount for your purchase. Maps of the ship are located all over the ferry so there is no chance of getting lost. On deck there is lots of seating (except Seacat and fast ferries) and it is great to watch the ferry leave the port. Children on board, and adults too, love to wave to those on the shore and vice versa. The ferry "Pont Aven" has a swimming pool and helipad! "Don&apos;t expect an undisturbed nights sleep!" 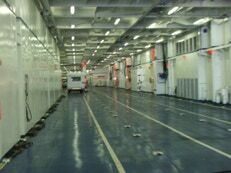 The cabins are situated on the lower decks. Usually they are open with the key inside, so if you know your cabin number it is simply a matter of following the signs down the long corridors to find it. Cabins are not just for night crossings, they are always cheaper on a day crossing and are an excellent base to store your things and to escape the throng on board. Wonderful too if you are a poor sailor! Ideal if you want a quick nap before or after a long journey and you can have a quick shower too to freshen up. It is sometimes possible to request an &apos;out side cabin&apos; this means you will have a window/porthole to look out of, the majority of cabins are fully enclosed with no windows. Don&apos;t worry about overlaying when you arrive at the destination port. For one you will probably not have had the most wonderful nights sleep! Mainly due to the noise of the other passengers as they pass by your door and the walls are not that soundproof either. Plus up until around midnight the &apos;bing-bong&apos; of the tannoy announcements (in both French and English) will most likely disturb you. These usually begin again in the early hours before you are due to arrive. If, after all that, you are still managing to sleep then one of the staff will walk around the cabin corridors ringing a bell - this signals that you will be arriving in port in about an hour. "No matter how many times you&apos;ve done it, arriving in France is still an exciting moment"
You will not be able to return to your vehicle until you hear an announcement asking &apos;all car passengers please return to your vehicle&apos; but this does not stop a large number of people gathering at the top of the staircases waiting eagerly to disembark. Don&apos;t panic! It will all seem such a rush but sometimes it&apos;s best to just stand back and let the numbers dwindle a little, after all the chances are that you will still have to sit in your car for several minutes anyway when you get to it. Why not have a minute on deck and watch the ferry sail into port. Hopefully you will have remembered which staircase you came up on and this makes find your way back to your car much easier. Leaving the ferry is just like boarding it, wait until beckoned to move by one of the staff and leave the ferry via the ramp. It&apos;s not unusual to be able to drive straight out and into France without any checks whatsoever. You might see the odd Gendarme or two watching as you leave but we have never yet been stopped or asked any questions, not even for our passport to be looked at. This is the point when you have to be at your most watchful, it&apos;s easy in the excitement to forget to drive on the right but most of the signs around the ports are in multi language to help you. All you’ve got to do now is enjoy your holiday. Click the link to see our article about driving in france.